NORTH MANCHESTER, Ind. 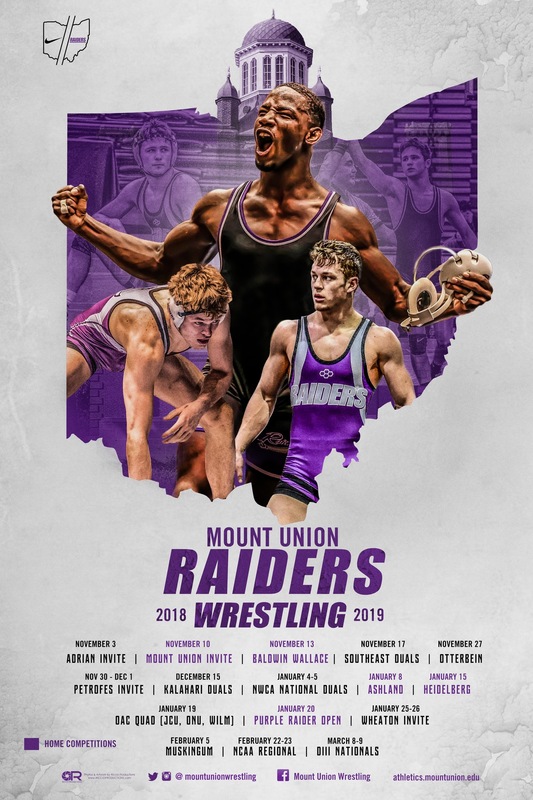 -- The Mount Union wrestling team had five individuals place at the 2019 Spartan Mat Classic, hosted by Manchester University, Saturday as the team collected 76.5 points to finish eighth out of 22 teams. Leading the way for the Purple Raiders was junior 125-pounder Seth Hayes (Ravenna/Rootstown) and freshman 184-pounder Jaden Mendeluk (Olmsted Falls), both finishing in fourth place in their respective weight classes. Juniors Kyle Jenkins (Stow) and Conner Homan (Loveland) both finished in sixth. Jenkins went 4-1 at 157 pounds with a techincal fall and a decision while Homan continued his pinning ways with four wins by pin-fall as he finished with a record on 5-1 on the day. Wrapping up Mount Union's placers was sophomore Leondre Cooley (Sandusky) with a seventh place finish at 133 pounds; Cooley tallied a pair of pins and a major decision. Mount Union returns home for Alumni and Senior Night as they host Heidelberg on Tuesday, January 15 at 7 p.m.